Mike Ashley has accused Sports Direct shareholders of stabbing him and the company in the back over the shock departure of the firm's chairman. The company's founder and chief executive claimed that investors had been "hounding" Keith Hellawell, who quit unexpectedly ahead of the company's annual general meeting (AGM) on Wednesday. In what will be interpreted as a threat to take the company private again, Mr Ashley also argued that "true entrepreneurs will never be accepted in the public arena" and that the shareholders had "now made it extremely challenging for future engagement to take place". Mr Hellawell's retirement marked the end of a controversial nine-year tenure for the former West Yorkshire Police chief constable and government drugs tsar, who had previously faced criticism over allegations of "Victorian" working practices at the retailer's warehouses. His approach to corporate governance also came under fire and at last year's AGM he narrowly survived a re-election vote when 47% of investors voted against him. In the run up to this year's meeting, influential advisory groups had urged shareholders to oppose Mr Hellawell's re-election, arguing he had lost investor confidence and failed to appoint any female directors to the board. 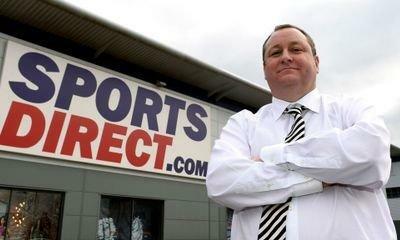 In a strongly worded statement to the City, Mr Ashley, who holds 62% of shares in Sports Direct, said despite the "progress and the undoubted good performance of Sports Direct", shareholders had "failed to support Sports Direct, Keith and myself". He added: "It is blatantly apparent that true entrepreneurs will never be accepted in the public arena. "The media circus surrounding Sports Direct, including but not restricted to matters connected to our AGM, only proves that whatever progress Sports Direct makes, it will always be subject to disproportionate scrutiny and misrepresentation. "In light of the above, and despite the substantial progress made over the last few years, the shareholders have now made it extremely challenging for future engagement to take place. "On the one hand they are delighted with our performance and progress, yet with the other hand they have stabbed Sports Direct and myself in the back by repeatedly hounding Keith Hellawell." Sports Direct shares were up by almost 1% up in early Friday afternoon trading. Speaking on Wednesday, Mr Hellawell said: "Having overseen significant improvements in the working practices and corporate governance of the company, which includes a refresh of the board, now is the right time for me to step aside." But Steve Turner, assistant general secretary of union Unite, said: "It's about time he resigned. During his tenure he has presided over shocking working conditions at the Shirebrook warehouse (in Derbyshire). "The question now is will his replacement stand up to (Sports Direct chief executive) Mike Ashley in the interests of workers and shareholders?" Mr Hellawell will be replaced by non-executive director David Daly. Some 9.8% of investors voted against Mr Ashley's re-election at the Sports Direct AGM after shareholder advisory groups criticised his "excessive influence" over the company.